Coastal Impact Fun is a member of the Global Partnership on Marine Litter, the premier global network for advancing solutions to reduce and eliminate marine litter in our oceans. Picture this: It’s tournament morning in coastal Tampa Bay and eager shallow water anglers are up at sunrise to compete - by skiff, kayak, center console, and canoe – in the area’s most exciting new “fishing” competition. At the festive check in tent, situated beside an area boat launch, more than sixty anglers of all ages and skill levels present themselves and receive a t-shirt and tournament bucket full of freebies supplied by supportive local businesses, a species inventory kit, and a simple rule book for the day’s activity. The mood is one of friendly competition, but the truth is that some of these anglers have been carefully scouting the local water for weeks in hopes of making a “catch” today, big enough to go home with their part of more than $25,000 in event series gear-prizes provided by fishing tackle sponsors. To the casual observer, this gathering of shallow draft vessels and local fishing families might look like any other well-attended inshore fishing tournament familiar to area residents, but this is a whole new ballgame. This is the Ghost Trap Rodeo Event Series for the removal of Tampa Bay’s derelict crab traps and marine debris. In 2018, our Florida-based nonprofit, Ocean Aid 360, was awarded a one-year NOAA MDP Community-based Marine Debris Removal Grant to test our innovative Ghost Trap Rodeo project, designed in partnership with the Florida Fish and Wildlife Conservation Commission (FWC) and the Coastal Conservation Association of Florida. The goal of the project is to remove no less than 15,000 pounds of debris from Tampa Bay, Florida’s largest open water estuary, which includes Essential Fish Habitat and protected marine zones, while also promoting a community stewardship and conservation ethic for NOAA Trust Resources. Sites were pre-selected through a flyover baseline survey. Last October, event promotions through social media and radio fishing show coverage began in earnest. With three events completed, the Ghost Trap Rodeo Event Series has resulted in 8,750 pounds of marine debris retrieved – including many derelict or abandoned traps, known as ghost traps. Back at the scene of the Ghost Trap Rodeo, excitement is in the air when angler-volunteers return to the dock after their four-hour search. The early morning talk of, “Do you think we’ll find anything?” is now replaced by shouts of “Look at all this stuff we found!” and “Wow! Can we help you unload!”, and for the first time, the volunteer group begins to understand what an impact they have had in today’s effort to restore the coastal habitat. There can be no doubt that the prizes are an exciting part of the experience for every team, but ask anyone here today and they will tell you they participated because they care about our estuary and saving this place so that our kids can experience it like we did. Thanks to a partnership with Florida’s FWC and the Coastal Impact Fund, crab trap materials collected at each Rodeo are re-purposed by State fisheries biologists as the base layer for new oyster reef construction. PALMETTO, FL - February 12, 2019 — Coastal Impact Fund, a 501(c)(3) nonprofit focused conservation programs which offer real world sustainable solutions to preserve and restore the marine environment, has been accepted into the Restore America’s Estuaries Affiliate Member Program. This will increases both the national impact and footprint in which Coastal Impact Fund and RAE can directly support community engagement and together, elevate the restoration, conservation, and resiliency work of our estuaries and marine coastal lines. "As we re-brand Coastal Impact Fund, we continue to look to make new partnerships that allows us to expand our footprint and objective of making a positive impact on the marine environment," said Devin Sanderson, President of Coastal Impact Fund. PALMETTO, FL – January 2, 2019 -- ReelCycle, Inc. - a 501(c)(3) nonprofit focused conservation programs which offer real world sustainable solutions to preserve and restore the marine environment – announced today that it is changing its corporate name to Coastal Impact Fund, Inc. The name change reflects the company's broader conservation commitment and its passion for driving the innovations needed to shape the future of long-term positive effect on coastal and marine resources. "The new name – Coastal Impact Fund – allows us to emphasize our expanding marine conservation objective with the goal of providing capital, equipment and creative solutions to projects," said Devin Sanderson, President of Coastal Impact Fund. "Through collaborations with our partners, we look forward to leverage the resources and efforts that enhance our world's waterways and marine environment." Coastal Impact Fund will continue ReelCycle’s project initiatives with crap trap removal and recycling, monofilament fishing line recovery, and other great projects. In conjunction with the name change, the Coastal Impact Fund will be introducing a number of new project initiatives including micro-grants, blue carbon awareness, and other projects that meet the standards of conservation, sustainability and financial responsibility with the goal of preserving and restoring the marine environment. The new name is effective immediately, and will be implemented across the nonprofit’s services. Coastal Impact Fund, Inc., a 501(c)(3) nonprofit, provides thought provoking conservation programs which offer practical, real world sustainable solutions to preserve and restore the marine environment.Coastal Impact Fund provides capital, equipment and creative solutions that make environmental and economic sense on impactful, and cost-effective projects that will have a long-term positive effect on coastal and marine resources.Coastal Impact Fund partners with non-profit organizations, businesses, trade associations, individuals and governmental organizations through collaborations to leverage the resources and efforts that enhance our world's waterways and marine environment. Please visit us at www.coastalimpactfund.org. 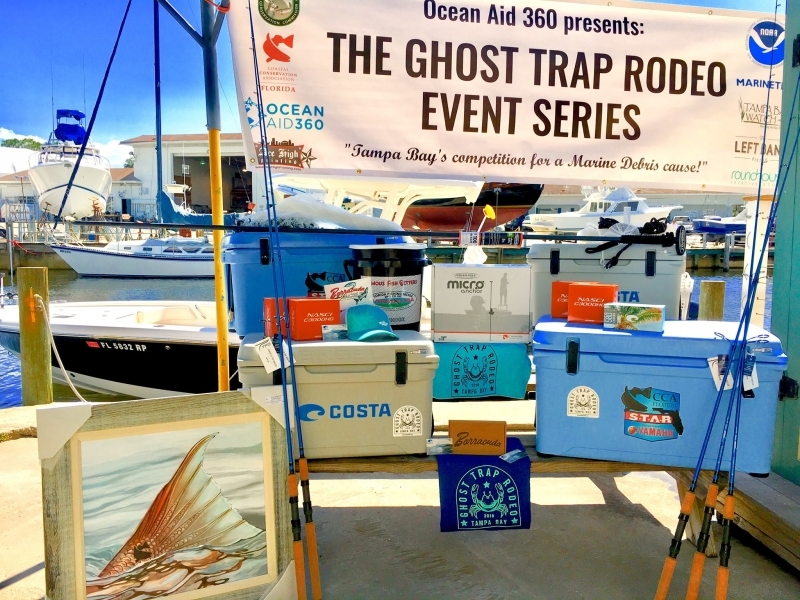 TAMPA BAY, FL, October 27, 2018 — As for an innovative six-event marine debris cleanup tournament called the Ghost Trap Rodeo Event Series, ReelCycle has partnered with Ocean Aid 360 to properly dispose of the crab traps collected during the clean ups. The Ghost Trap Rodeo Six-Event Series is a collaboration between Ocean Aid 360, Coastal Conservation Association, NOAA, and the Bay-area’s best marine conservation agencies, intended to mobilize the area’s shallow water anglers who will draw on their intimate knowledge of the fishery, as they spend a ½ day detecting and removing Ghost Traps and other forms of marine litter. At the end of the four-hour search, volunteers participate in a “weigh-in” of their debris and top collectors win industry sponsored prizes. The name ‘Ghost Trap’ refers to abandoned crab traps, which number more than 10,000 in Tampa Bay waters, and have become lost (such as when a trap buoy is ripped off during hurricane wave action) or abandoned to continue “Ghost Fishing” unchecked by any fisherman. These Ghost Traps kill thousands of pounds of commercial-grade crabs and fish, negatively impact the recreational fishery and estuary habitat (the nursery for marine life), and are a serious hazard for boaters. SARASOTA, FL, October 20, 2018 — Sarasota Bay Watch conducted its second Tony Saprito Fishing Pier Cleanup with 40 volunteers. ReelCycle assists Sarasota Bay Watch in using the best practices for the recycling of discarded fishing line/nets/traps by having the items burned and creating electric energy. over 300 lbs of fishing nets, line, rope and other debris were recovered in the cleanup. Divers were pleased with increased visibility and fish sightings noted from last week when a cleanup of the North Jetty in Venice took place. With the central location of the Saprito Pier many onlookers learned a great deal about underwater cleanups, the items retrieved, the abundance of marine life that can be trapped in nets and debris and the terrific work that takes place within Sarasota by those who love their water. 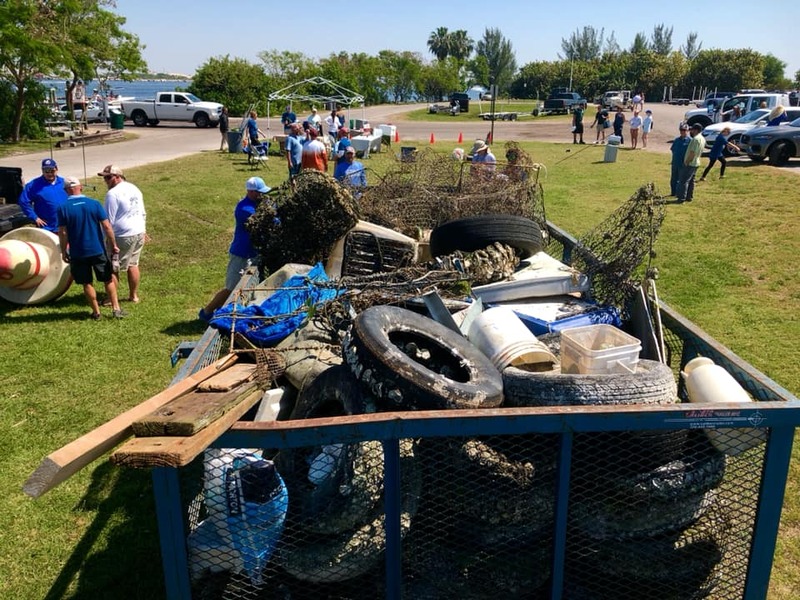 PALMETTO, FL, September 10, 2018 — ReelCycle partnered with SunCoast Aqua Ventures on the 2018 3rd Annual Reef and Beach Clean Up at the Bradenton Yacht Club. With over 110 participants, 10,000lbs of trash, debris, fishing line, rope, tires, anchors, and much more weighed in from local bays, channels, ramps, mangrove islands, estuaries, bridges, and shorelines. ReelCycle provided gloves to all participating teams and also supported a team to be a part of the many volunteers that made this event a success. In addition, ReelCycle properly disposed of all the fishing nets, line and traps collected throughout the event. VENICE, FL, October 23, 2017 - Venice’s awesome dive club came together again at the South Jetty on Sunday October 22, 2017 and pulled a monstrous amount of debris up from the depths. 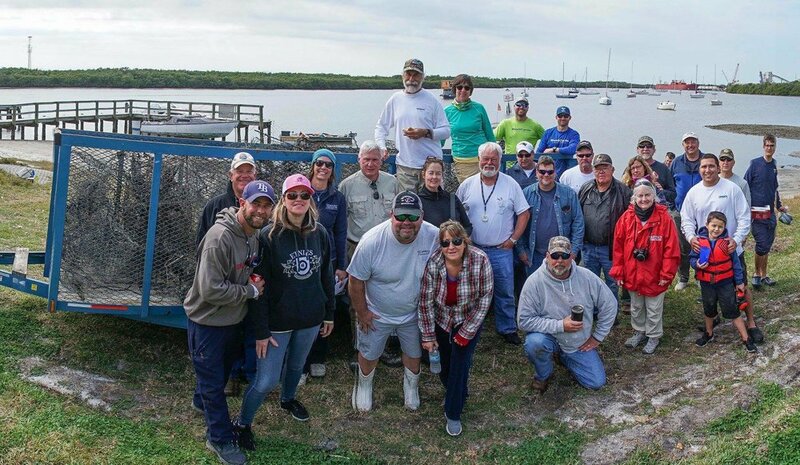 Over 500 pounds of marine debris was taken from the water by this wonderful group, including 42 cast nets, 3 traps, and over 100 pounds of lead. The weirdest find was a cell phone with a heavy metal bolt taped to it (makes you wonder doesn’t it). Other interesting items were wine goblets, a plastic snowflake, 5-pound dumbbells, and a full tackle box encrusted with barnacles. It’s amazing how the nets, once they are down there, start entangling all kinds of fishing rods, poles, lures and trash. Stone crabs and other marine life that were inadvertently brought up with the debris were gently returned back to the water. ReelCycle partnered with Sarasota Bay Watch and Suncoast Reef Rovers of Venice on this project. Important safety support came from the City of Venice Police and County Sheriff’s Office who provided an officer and boat to keep the divers safe. Thirty-eight people volunteered – 13 SCUBA divers, one snorkeler, 5 kayakers, 2 canoeists and a big group helping from on land.